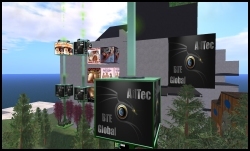 There’s a new battleground emerging for Second Life copyright claims: protest screenshots of in-world ad farm installations. “Ad farms” (collections of skyline-busting animated billboards that have spread across the Second Life landscape) are widely despised in-world because many owners use them not to generate advertising revenue in any traditional sense, but to force neighbors, often who have been there for years, to buy the property on which the advertisements are placed at grossly inflated prices in order to preserve their virtual views. The current fight involves Second Life user (and noted steampunk builder) ‘Ordinal Malaprop,’ who put some pictures of various ad farmers’ advertisements in Second Life up on Flickr in order to call attention to the problem and try to shame the advertisers into removing the ads. One of the ad farmers, Second Life’s ‘Cytherea Eagle,’ filed a DMCA takedown notice with Flickr. Flickr complied with the notice, and the photographs were taken down. ‘Malaprop’ has posted regarding the incident. VB ran a “quicklink” about this a few days ago, but more details have emerged. There’s a thoughtful post at New World Notes, and some cheery DMCA bait at The Click Heard Round The World. Here’s a summary of some of the intellectual property issues, from Wagner James ‘Hamlet’ Au’s New World Notes. If you’re a photojournalist reporting on the news in New York’s Time Square, you don’t need to get the permission of every business owner whose logo and trademarks will surely show up in the published photo. That’s because there’s already an established legal precedent of fair use. (Especially if the logos are part of the news– for example, photos of an anti-globalization protest outside a Nike store.) Trouble is, every Resident owns the IP rights to their content [...] to my knowledge, no real world court has adjudicated over its fair use by others, in similar contexts. No matter how this particular incident shakes out, the bigger issue appears likely to recur. Advertising, particularly advertising tied to overpriced land, is a genuine blight on the Second Life landscape. Community action via blogs, sites like Flickr, and in-world publicity appears to be the best way to call attention to the problem. Advertisers who attempt to use the Digital Millennium Copyright Act to curtail legitimate commentary are inviting a lawsuit. Damages are available for frivolous or fraudulent filing of DMCA takedown notices. The analysis at New World Notes is entirely correct, but it focuses chiefly on trademark infringement, which is actually not covered by the DMCA. Though Flickr may well have a policy governing allegations of trademark abuse, it appears that a DMCA notice was filed here, so I’ll focus on copyright issues, and briefly discuss the trademark implications in closing. I personally feel DMCA claims are all-too-often abused, though they certainly do have their place. As a writer covering these spaces (who regularly finds it helpful to illustrate articles with pictures) I must acknowledge my instinct, and desire, that screenshots of public spaces in virtual worlds, particularly newsworthy screenshots, not be subject to DMCA takedown claims. Happily, this is not an instinct in a vacuum; though untested, the law probably supports this position. That’s good news for virtual shutterbugs. In terms of legal analysis, there are at least two ways to look at this. One is the same way we look at copyrights on buildings. Here’s a thumbnail of this analysis from the Picture Archive Council of America. The Copyright Act specifically provides that the owner of the copyright to a building that is located in, or visible from, a public place, cannot prevent third parties from taking or distributing photographs of the building. The building analogy isn’t a perfect fit, and there are obviously some new issues raised in relation to virtual worlds (e.g. the nature of “public” versus “private” areas in a virtual world where the viewpoint camera is mobile and can be largely disconnected from the user, as it is in Second Life). That said, it seems intuitive — and if one must argue for an extension of the law, that’s not a bad place to start. The same public policy concerns that justify the building exception could be said to apply in a virtual space as well. On the other hand, another way to analyze this is that every single thing in a virtual world — from flowers to benches to garbage cans to buildings — is “public art.” In the real world, people wishing to print pictures of otherwise copyrighted public art must, generally, seek the permission of the artist. That offers stronger protection for creators than the building analogy, obviously, but it’s a bit of a stretch, and seems to fly in the face of logic to call every single object in a virtual space protected art. Perhaps most importantly, “fair use” provides a huge exception here under either analysis. Photographers do not have to seek permission to publish photographs if the use falls under the definition of fair use. I would argue that taking pictures of ad farms and putting them on Flickr (or for that matter, taking pictures of Second Life builds and running them with news articles) amounts to use for “criticism, comment, [and] news reporting,” and thus is “fair use.” So even under the “public art” analogy above, most people’s use of screenshots from virtual worlds would be protected. Notably, selling a coffee table book of famous Second Life art installations would arguably not be protected — and maybe it shouldn’t be. This question forms the basis for some of the most interesting current arguments about copyright law. The trademark issue raised at New World Notes is arguably even easier to resolve in favor of virtual photographers — a fairly low percentage of Second Life builds are “indicators of a source of commerce,” which is the foundation of a trademark claim. And as noted at NWN, when a trademark appears in coverage about that trademark or news related to the industry in which the business behind that trademark participates, that use is protected (e.g. a story about botulism poisoning at a fast food restaurant can obviously feature the logo of the restaurant where it happened in an accompanying photograph). A very helpful analysis that should help to prevent people from being deceived by the dishonest. Additionally of interest to those whose content is being taken down by DMCA notices is the concept of counter-notification. 17 USC 512 (g) (3) explains the procedure under which a content owner may contest a takedown notice and request that an OSP reinstate access to their material. Presumably, a content owner can preemptively challenge the take-down with a fair use defense. After posting, I remembered a couple of earlier posts on ad farms, lawsuits, and so on from Nobody Fugazi that are definitely worth reading for background, ideas, other theories, etc. A Class Action Lawsuit Related to 16m Ads? You see, many of these ad farmers don’t even own the rights that they claim to have. Ordinal’s just the next one griping. Hamlet has ignored the issue of ad farms so long that its laughable that it took this for him to take it seriously (sorry, Hamlet, calling it as I see it). Rik’s the same way. It *finally* got their attention, and I’ve got about a year’s worth of archived data on the subject. They’re covering it, I’m bored with it. :-) I’ll comment here, but I’m unlikely to write about it myself until something actually noteworthy happens. The DMCA tactic is not noteworthy. If someone wants to pull the DMCA on screenshots of their work within Second Life then they probably shouldn’t be putting them in Second Life. That is, quite simply, a no brainer. However, the tactic is one that I have planned to use for some time when it comes to defending one’s reputation. Seeing it used here does not surprise me. It surprises me that so many people are surprised. And the hilarious part – and the irony – is that someone is filing a DMCA on advertising areas that… thrive on attention. DUH. 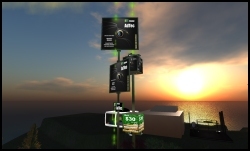 (1) Ad farms are considered a negative behavior by the majority in Second Life. I’m going out on a limb by saying that, but I’m sure an independent poll would say that they are disliked. At best, they are tolerated. The money behind them is easy. (2) Infringement of copyright/trademark is considered a negative behavior, but as noted here and in most places where people are literate, fair use is pretty self-evident. ‘Fair Use’, however, has many implementations globally. If Ordinal were in Antigua, for example (http://www.knowprose.com/node/18354 ), Flickr would be in the middle of a WTO discussion! (3) Linden Lab has to comply with DMCA, as does Flickr and any web host of data. But if Linden Lab didn’t reward negative behavior, Ordinal wouldn’t be accused of a DMCA violation. I’m betting this blows over, unless Ordinal is willing to lawyer up and protect Fair Use in the United States. As for me, personally, I’d write Flickr – but if Linden Lab does not write Flickr and state it is a public space, then Flickr has to protect its interests. The most important aspect of this, that everyone is completely missing, is the citizen journalist aspect. Using the DMCA in this way defends reputation, but it also erodes anything resembling ‘Fair Use’ in international copyright law. I believe that the use of the abuse clause is ideal in this situation. Far too many people and companies are using the DMCA to remove or censor content they don’t want posted. You are very well informed about this being more of a trademark issue than a copyright issue. I would certainly pursue this path. All too often web hosts believe they have the right to remove content immediately upon receiving a DMCA notification. The item need not be removed immediately. In some cases, the entire site is taken down temporarily until the user files a counternotification and the notification is deemed valid. In other cases, I have run into people who received no notification from the ISP or host at all. 4. Users will use the counternotification to maintain their rights.